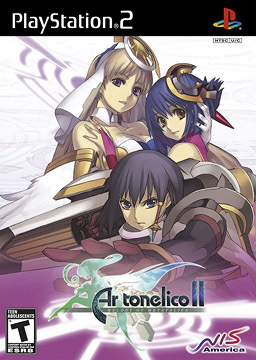 Ar tonelico 2 : The Melody of Metafalica on the PS2, is the follow up to Ar tonelico : The Melody of Elemia. The game takes place on the planet of Arciel in the Metaflass region. This game in the series revolves around a young knight named Croix, a knight for The Grand Bell Church of Pastalia. The Reyvateils ( a race of artificial lifeforms created to be able to transform sound into energy) in this region are becoming sick and raging due to an illness called Infel Phira Dependency. This quest will soon lead to a much bigger discovery as you set out to find The Legend of the lost Hymm Metafalica . Playing the first game in the series in not required to enjoy the second one but I do recommend it so you will get all of the references from the recurring characters. This game has a very unique combat system as it is set up into 2 phases, an attack phase and a defend phase. In the Attack Phase you can do as many attacks as you can within the time limit. Some attacks will build up the song magic your Reyvateils will have available. In the defense phase you will block for the Reyvateils since they are singing for the spells you have to fend off any enemy attacks by doing timed button presses. It sounds like it would be a pain to do this but it is really fun and makes the combat really stand out. The relationship between Croix and his Reyvateils is very important as the closer you become to them they will gain more powerful song magics. You gain these by what is called the Dive System where you go into the Reyvateils mind or Cosmosphere as the game calls it and you will see their deepest emotions which will help them unlock more powerful song magic. Each Reyvateil has a unique story in their Cosmophere as well as different outfits you will unlock by completing the levels. The outfits will give the Reyvateils various stat bonuses as well. In order to build up the relationships of the characters in the game there are conversations that take place at certain points in the game. You will find these in different areas of the game and when you pick them up you go to a save point and watch the scene. This will build the relationship of Croix and Reyvateils. The Reyvateils build up relationships with each other through, what else, bathing. Yes, I said bathing. Putting the girls in the bath with different crystals will not only build up their levels but putting certain bath toys and aromas in with them will spark up conversations which make the girls closer together. This will allow for some combo song magic in battle when they are close enough. There are several different places to explore within the game world and each place feels a bit different from the last and there are always a few hidden surprises in each level. The game also features a robust item synthesis system where you can make item, weapons , and armor at each of the game’s shops. All in all I really enjoyed all of the Ar tonelico games but this one stands out above the others for the impressive combat and story. I found myself playing it several times just to see each of the game’s endings and enjoying every single play-through. You should give this series a chance if you haven’t.